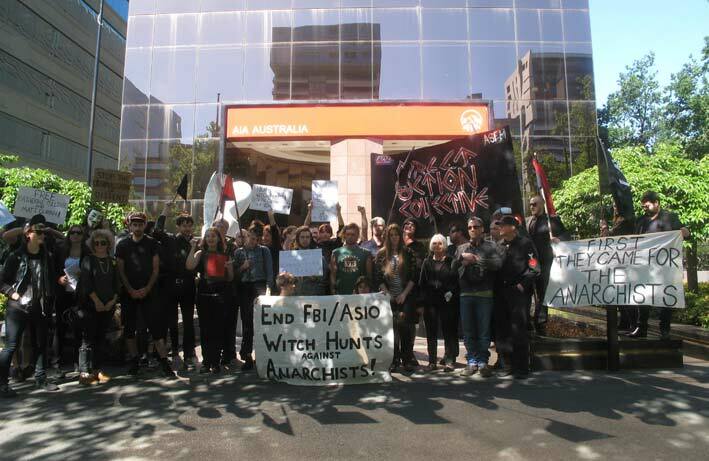 Yesterday about 40-50 people gathered outside the US Consulate in Melbourne to protest the imprisonment of grand jury resisters Matt Duran, Katherine Olejnik and the likely detention of Matthew Pfeiffer who has said they will again refuse to speak to the US inquisition on December 14. Two cards were circulated for Matt and Katherine, with protesters writing messages of support on them. Speeches were given by members of Anarchist Affinity and the Melbourne Anarchist Club as well as by individuals, and folk-punk bands Year of Scummery and Glitter Rats played a set in the sunshine. A grand jury is a legal processes in the US that is supposed to decide whether investigators have sufficient evidence to charge someone with a federal crime, but they are conducted largely in secret and have the power to imprison those who refuse to give evidence for up to 18 months. Grand juries are usually so-called fishing expeditions by US authorities when they have no evidence of but would like to intimate political movements. This particular grand jury is aimed at anarchists who are visible activists in the community. You can write to Matt and Katherine at the addresses below, or visit nopoliticalrepression.wordpress.com for more information.